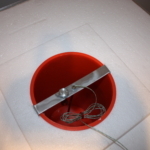 The purpose of the HeatBox is to determine the heat of hydration of a concrete mixture, which may be used as input information for a thermal analysis program. It is one of the components of a complete thermal control system that also includes B4Cast and HeatWatch or TMS. 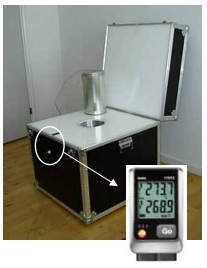 The HeatBox determines the heat of hydration of a concrete mixture based on the principle of semi-adiabatic calorimetry. 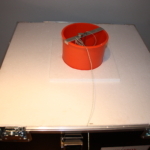 A specimen of fresh concrete is placed at the center of an insulated container. 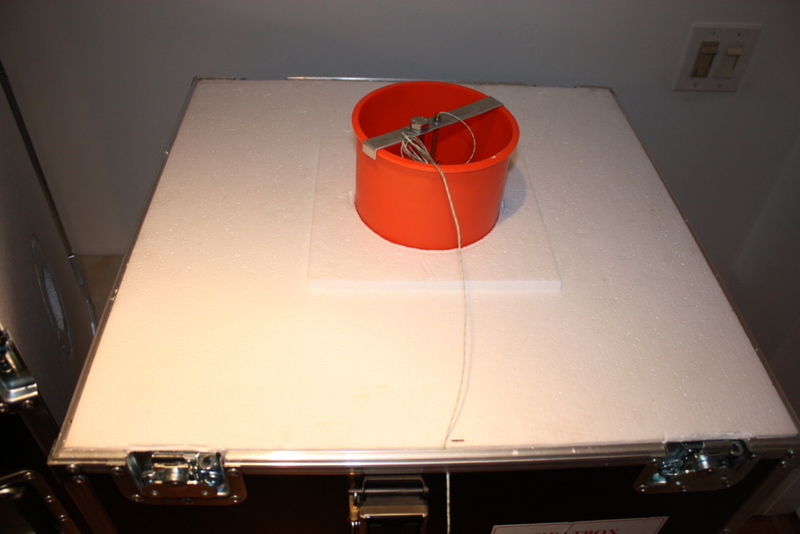 A portion of the total heat generated by hydration raises the temperature of the concrete specimen and a portion is absorbed by the container and transferred to surrounding air. 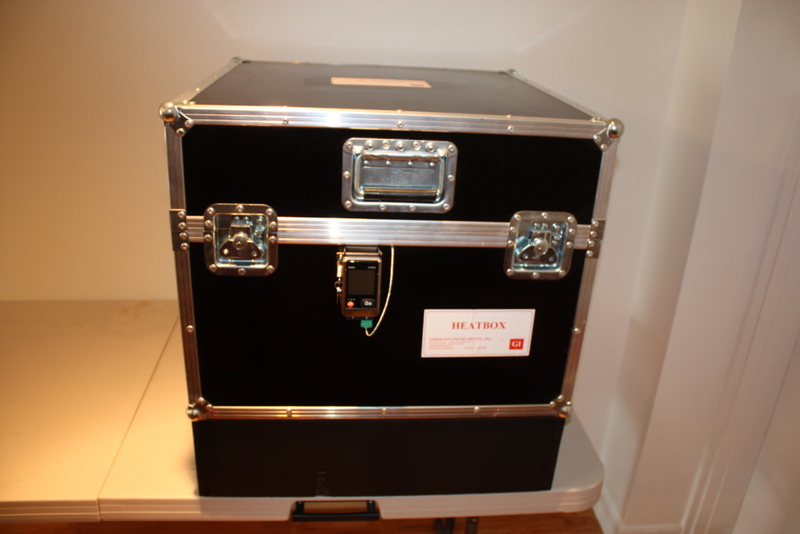 The amount of heat absorbed by and transferred through the container can be established by appropriate temperature measurements of the insulation material or it can be determined by numerical simulation provided the thermal conductivity and heat capacity of the insulation are known. 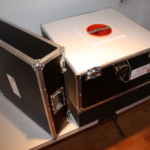 The HeatBox system is based on the second approach. 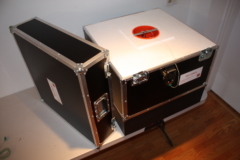 The thermal properties of the container are established by a standardization procedure in which the mold is filled with water at an initial temperature of 40 to 45 °C. The water- filled mold is placed in the container and the drop in water temperature is recorded until the water approaches room temperature, which generally takes about 5 days. In the graph to the right, water temperature is shown in red and ambient air temperature is in green. The thermal properties of the insulation are determined by an iterative analytical procedure. Values of specific heat and thermal conductivity of the container material are assumed and the temperature drop of the water is calculated using the initial measured water temperature and the measured air temperature as boundary conditions. 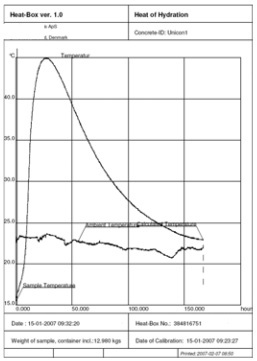 The calculated temperature-time curve is compared with the measured curve. The thermal properties of the container material are updated and a new temperature-time curve is calculated. The process is repeated automatically by the software until there is agreement between the measured and calculated temperature history of the water. The final values of the thermal properties of the container material are used in subsequent analyses to determine heat of hydration. The process to determine heat of hydration of a specific concrete is illustrated schematically in the above figure. The mold is filled with fresh concrete and the concrete temperature and the ambient air temperature are measured until the concrete is within a few degrees of the air temperature. A step -wise, iterative thermal analysis is performed by the software, which determines how much heat had to be evolved within a small time interval to produce the measured concrete temperature rise within that time interval. The analysis takes into account the thermal properties of the concrete and heat absorbed by and lost through the container based on the previously established thermal properties of the insulation. The software moves to the next time step and the incremental heat evolution is evaluated for that interval. The process is repeated automatically until the total time of the test has been accounted for. The end result is a cumulative heat of hydration curve in units of kJ/kg of concrete. The time axis is converted to equivalent age using the Arrhenius maturity function based on the user-provided activation energy for the concrete mixture. 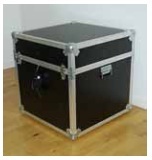 The HeatBox is a 600 x 600 x 600 mm insulated box with a central space for a 150 x 300 mm cylinder mold. The system includes a 2-channel datalogger and two temperature sensors to measure the concrete temperature and the ambient air temperature. 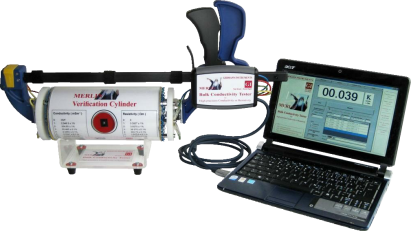 Before starting the test, the datalogger is connected to a computer and configured for data acquisition. The concrete mold is filled with fresh concrete and the mass of the concrete is determined. 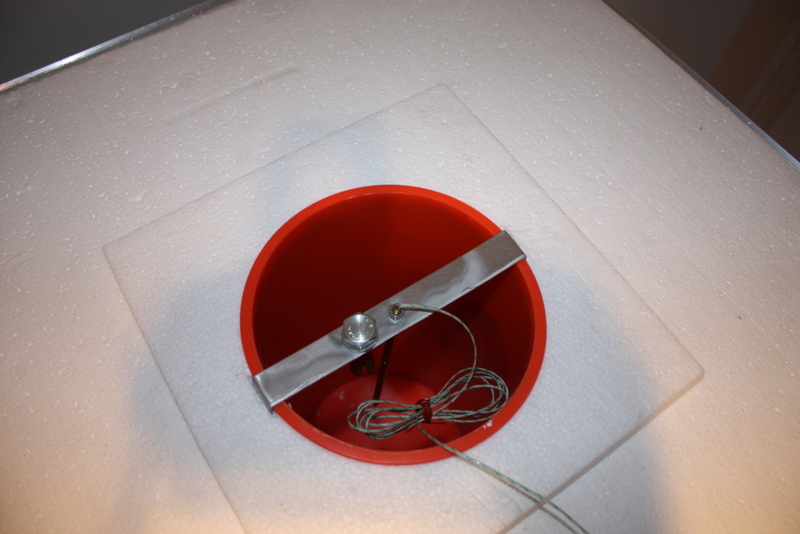 The mold is covered with a lid, a sensor in inserted into the specimen using an expendable brass tube, and the datalogger is activated. The mold is placed in the container and the HeatBox is closed. Temperature data are recorded until the concrete temperature falls to within 5 °C of the air temperature. After temperature measurements are completed, the HeatBox software is started on the computer. The button “Calculate Heat of Hydration” is clicked, and the user copies the temperature data from the datalogger to the computer. Next, the cementitious material content, density, heat capacity, thermal conductivity, and activation energy for the concrete and the specimen mass are entered. 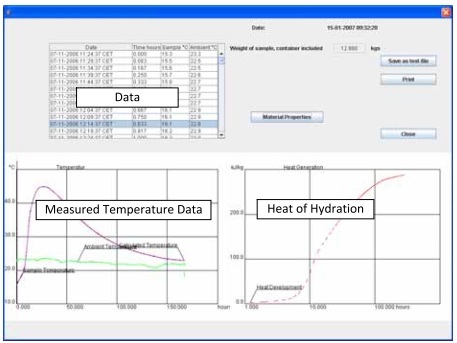 The “Calculate Q” button is clicked, and the HeatBox program begins the iterative analysis to determine the total heat of hydration as a function of the concrete maturity. 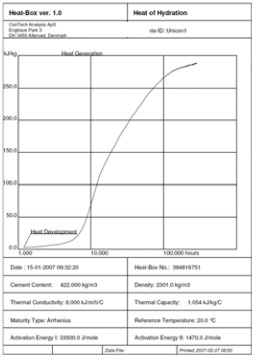 When the calculations are completed, the recorded temperature data and the calculated heat of hydration curve for the concrete are displayed. The points that comprise the heat of hydration curve can be stored in a text file, which can be used as input for subsequent thermal analysis of a structure made with that concrete. Computer display showing the measured data and the calculated heat of hydration as a function of equivalent age (maturity). 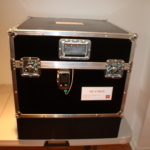 In addition to storing the points that comprise the heat of hydration curve, the measured temperature histories and the calculated heat of hydration curve can be printed for documentation of the results. The material properties used in the data analysis are also displayed.